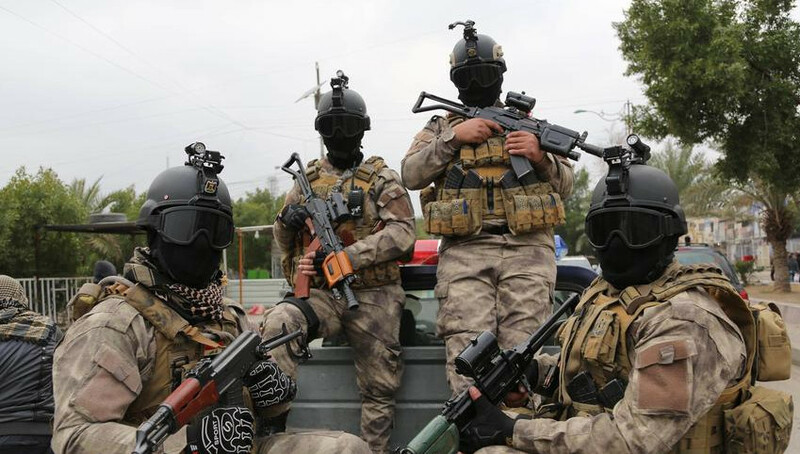 Iranian-supported Iraqi armed factions have dialed up anti-American propaganda and hostile rhetoric against the U.S. troops in Iraq, Al-Araby Al-Jadeed, a pan-Arab media outlet based in London reported. It added that militia groups within the Popular Mobilization Forces (PMF), also known as Hashd al-Shaabi, have recently hung dozens of posters and billboards in the Iraqi capital city of Baghdad, denouncing Washington. According to the report, these paramilitary groups have erected large banners in eastern Baghdad which carry Trump’s photo and anti-U.S. slogans such as “Death to America” and “Evil Trump”. Al-Araby quotes Hussein al-Daraji, a PMF commander, as saying that “the Islamic resistance factions in Iraq supervised the process” of installing the banners. “The images are part of the campaign to confront the arrogant American and Zionist [Israeli] forces in Iraq and Syria and to support the Houthi brothers in Yemen,” the commander added. Comment: Since the end of the fight against ISIS in Iraq, PMF units close to Iran have been calling for the withdrawal of American troops from the country and some of their commanders have also threatened violence if the Trump Administration refuses to pull out U.S. troops. An air strike targeting positions of pro-Syrian regime, Iranian-backed forces along the Iraqi-Syrian border last month has further exacerbated tension between the PMF and American troops. The U.S. denied any involvement in the attack, which was allegedly carried out by Israel. But PMF leaders blamed the U.S. forces for the strike, which they said had killed more than 50 combatants, about half of which belonged to the PMF. After the attack, several PMF commanders threatened retaliation against the U.S. Kata’ib Hezbollah, a group within PMF with close ties to Iran and Lebanese Hezbollah, said the strike “will reopen the conflict with the Zionist entity” and with the United States. Mahdi al-Muhandis, the operational commander and deputy head of PMF, echoed a similar note. “We will not be silent toward Washington and its targeting of the popular forces,” he said, accusing the U.S. of targeting the PMF to weaken it. The PMF, a network of dozens of militia units formed to fight ISIS, has been dominated by Iranian-backed paramilitary groups such as the Badr Organization, Kata’ib Hezbollah, Asa’ib Ahl al-Haq, and Harakat al-Nujaba, among others. Based on a government decree, the PMF is now an integral part of the Iraqi security forces, and PMF members receive the same salaries and benefits as those of regular security personnel. But PMF leaders have made it clear that they do not want the organization to be completely merged into the Iraqi security forces and plan to remain an independent institution despite concerns inside and outside Iraq. Iranian-linked PMF groups also formed a political coalition, called Fatah Alliance, which contested Iraq’s parliamentary elections and came second to Muqtada al-Sadr. Sadr’s coalition and the Fatah Alliance have recently formed a new coalition to form the next Iraqi government – potentially further cementing Iran’s influence in Iraq. Fatah leaders have said that they would seek a timetable for the exit of U.S. forces from Iraq. Read daily news briefs and longer analyses like this at the IranObserved project. You can also subscribe to receive daily briefings delivered to your inbox. Assertions and opinions in this publication are solely those of the above-mentioned author(s) and do not necessarily reflect the views of the Middle East Institute, which expressly does not take positions on Middle East policy.